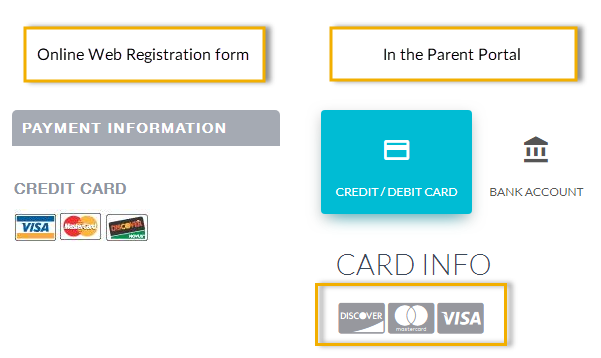 When you are set up for credit card payments in Jackrabbit you must edit your settings to select which cards you accept and whether or not you will allow multiple credit cards to be stored in 1 family record. This is done from the Credit Card/Bank Account Settings located in the Tools menu. These settings affect your Online Registration Form and your Parent Portal. An error message will be received if a family attempts to use a card that is not accepted. Jackrabbit offers the option to maintain up to three credit cards on file for each family. One card can be selected as the customer's Primary Card (the card that the family considers their main credit card and the card that is used in Transactions > Process Credit Cards/Bank Accts). Update the Allow 3 credit cards per family/account setting based on whether you prefer to maintain up to 3 cards or prefer to only allow 1 card per family. You can learn more about using multiple cards on file by going to Multiple Cards per Family.